I don't feel like digging up the data, Sentient has already done it 3 or 4 times now, every time someone comes in here and say's what you're saying. Him and Kuz are neck and neck as far as off ball movement is concerned. They are also among the league leaders in that regard. Where the "lazy" Ingram is 9th in the league? Yep.. lol. and thanks again.. This guy came and spent the day trashing Ingram before he went off after the all star break. Then when Ingram was on fire... he went conveniently missing... saying he has a busy life so he had no time to post. Ingram's a work in progress... his injury is a risk factor... but I don't get hating on a player with so much potential. Check my post history. I didn't post here a lot before or after that. Most guys will tell you I post much more on another site and even there, mostly early in the morning or late at night. But I owe you no explanation. Believe me or don't. It honestly doesn't matter to me either way. As you said you owe no one any explanations... it's a free country. I only said I was baffled as to why you come at random times to bring him down when there's no new information or play to stimulate conversation about him. It'd have been nice if you had said something good when he was doing well... then I'd look at your take as a more objective one. I was very concerned at his exit interview. I have been somewhat critical of his play (although I think I have said nice things when he has played well too), but my first reaction to the exit interview was one of pity and concern. This young man may not have a healthy future, and while basketball is important, my prayer is that he can regain his health and have a productive life. Prayers Brandon, get yourself healed up, and I wish you the best going forward. Ingram's February shows why he'll never be a good three point shooter. 6-7 in two games, 1-11 in the other 7 games. 7-18 for the month. 39% on 2 attempts per game is good if this is 30 years ago. I can see why a 39% average his second season convinces some that he can shoot. Unfortunately, when a coach sees that BI doesn't have any made three pointers in 30 of his past 52 games, that coach is adjusting his defense accordingly. He's inconsistent with low volume, with no improvement this past season. BI’s maturation was his aggressiveness, and confidence. When I saw him waive off Bron, I knew this man is not a kid anymore. Watching Simmons dominate the Nets today while taking no 3’s, and the world doesn’t complain. Ingram hits 1 three a game and LG he needs him to be out there like Klay or Dame just raining down from beyond the arc. Let him be folks. Basketball existed before the Warriors dynasty and it’ll last long after it. Just for some off season fun, NBA 2k released a special diamond rewards card for Ingram. maybe 2k expects Ingram to make a big jump next year? One possitive is he will gain ALOT of weight. When i was put on blood thinners for 6 Months I gained 30-40lb. I was getting hungry alot more often and the inactivity helps also. Simmons scored 31 in a playoff win with a +11. Ingram has never scored over 30 in a win. In the 4 games he’s scored over 30 in his career, he’s been a -11, +2, -14, and -8. It’s not all about shooting 3s, it’s about getting your team a win. It was only a few short months ago some of you were saying Ingram was incapable of scoring over 30... incapable of averaging over 20. Now it's... well he needs to score over 30 in a playoff win with a positive plus minus? Yes, it's fair to have doubts about Ingram... especially because of the current state of his health... but if you put a post all star break Ingram with shooters like Tobias and Redick and a star like Jimmy... I think he'd have done fine himself with a spread floor in place of Simmons. I never said incapable, maybe you are mixing me up with somebody. He very rarely scores 30 and 4 times in 3 years proves it. My problems with Ingram have always been that I don’t believe his game translates to team success very much. Whether he plays well or poorly, I think that’s been the case for 3 years. I haven’t moved the goalposts at all and I don’t need any kind of specific numbers to be happy with his play. I want to see him have success in winning efforts and to do that I think he needs to play a different role on the team than the one he played in his great post trade deadline play. I don’t think his current playstyle/role will allow the team to have success. I don’t think he would have the success that Simmons has if he replaced him. I don’t think he does well as a PG. He doesn’t have near the floor vision, ball handling, or explosiveness of Simmons which allows him to play the way he does. Yes, it was only in six games before the diagnosis. But he had been trending upwards as the season went on. It is if you are injured as much as the Lakers are! We’ve had a losing record the past 6 years or so lol. Who on this team besides Caruso has contributed to winning games on a consistent basis? He’ll be fine once we have a proper coaching staff. He’ll score his points and we’ll start winning then you guys can go back to just complaining about his hair. I said some of you... you were in the pessimistic group about Ingram... so I grouped everyone together... but if you didn't say something to that effect, I believe you. I agree with you that he's got a long way to go... and that he doesn't have the handles or floor vision of Simmons... but considering BI can score anywhere from the three point line to the rim... and was trending upwards on both his three and FT shooting, he also has his strong points. For all that extra handling ability, Ingram still lost less balls than Ben (42 to 62) and he had a higher usage rate. That's even factoring in that Ingram played less games. Remember also that Ingram played with LBJ, Lonzo, and Rondo. So Ben's assist turnover was way superior... but Ingram's was much better before Rondo and LBJ came, and probably about the same when Lonzo was out last year and he was running the offense. I like Ben... I said I'd even trade him for LBJ in anticipation that one day he might learn to shoot. 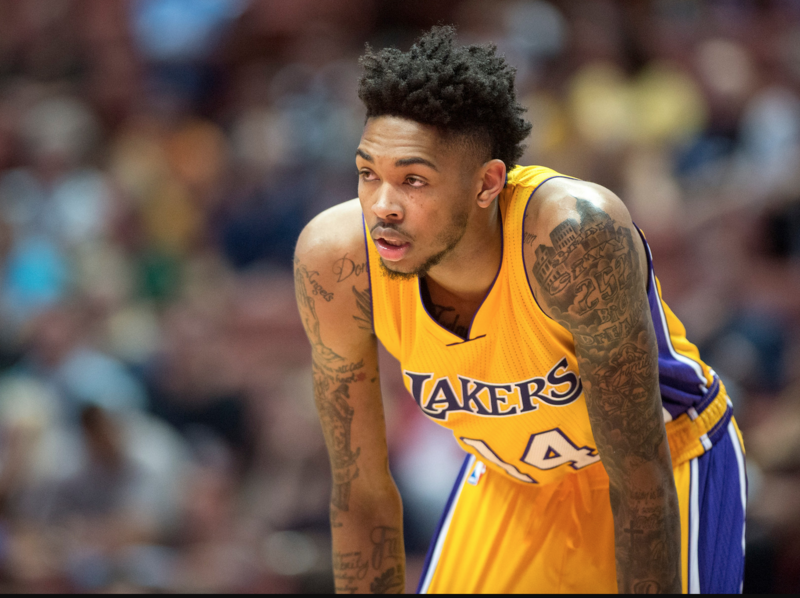 But don't sleep on Ingram... he has a long way to go... but if his injury isn't permanent, I think he will grow into a more efficient player. He already was before the clot. What about his game do you believe does not translate to team success? Maybe better you could describe how he should change the way he plays that will contribute to team success? From my perspective how do you evaluate how much a player contributes to a teams success when said team (Lakers) is bad? I give you the example of Oladipo who had no team success at Orlando but put him on a good functional team in Indiana and well you see the difference and I don't see much change in how he plays the game, he just improved what he normally does. In regards to replacing each other on their respective teams I don't believe Simmons would experience the success he does in Philly because he would not have the ball in his hands as often as he does now. I don't think he would do well as a SG as he basically cannot shoot beyond 10 ft out from the basket. I’ve spent pages and pages describing why I feel that and how I think he needs to adjust. I think most on here don’t wanna read it again. It has a lot to do with hoevthe team functions while x player is on the floor. How do they impact others(both positively and negatively? I didn’t watch much Magic basketball with Oladipo so I don’t have the context necessary to respond to that. I don’t think he’d be a good SG either. Pairing him with Bron and Zo would be dynamic in transition but tough in the half court. Idk how it would look. Just speaking from an offense standpoint the primary adjustments I would like BI to incorporate into his game is 1) passing off the drive to a cutting teammate, 3pt shooter or a lob to a teammate. He does flash these at times showing he as the ability; 2) cutting to the basket without the ball which I believe he has improved on during the later part of this season; 3) the 3 pt shot; 4) more counter moves once he is in the paint. The thing about BI which leaves me hopeful is during his interviews he appears to have a good self understanding of his game and what he needs to improve upon. Now it is just a matter of incorporating these changes. The question one has to ask if Ingram is finishing at a 68% compared to Simmons finishing at 70%... is do you want someone dishing off to the 29th best three point shooting team? If you are passing to Redick and Harris... even Jimmy and Joel... it makes sense to look for that open man... if you are finishing at the rim at the same rate as Ben without the floor spreading, is it advantageous to pass to Kuzma shooting at 30%? I saw a lot of games where Ingram would dish off only to see our shooters brick it. I truly believe in a team full of shooters, that BI would be happy to pass more. The game where he got 36... he could have easily got 40... if he was Kuzma's mentality... he would have scored 40 to 50. Instead he still played within in the flow of the game and didn't try to pad his stats. Get Ingram shooters and he will finish at over 70% and get more assists. Josh, Kyle, KCP were all bricking when Ingram was playing. Can't blame him for trusting himself at that stage of the season. I like those adjustments although I think you missed one of the most important ones. He needs to make quicker decisions when he gets the ball and either pass, attack, or shoot. The dribbling in place going nowhere drives me nuts. I agree with everything besides that he’s improved as a cutter but to be honest I couldn’t watch much Lakers towards the end of the year as I would get angry. I hope you’re right but I’m worried he’s just saying what he thinks he should say and doesn’t believe it as I haven’t seen the improvements I expected to see in those areas. I believe Kuz does a much better job of playing within the flow of the offense than Ingram. That might be what’s at the core of our disagreement. But I agree, Ingram is a very good finisher at the rim. Best on the team besides LeBron.